​Skiing is one of my favourite forms of exercise and Austria is my favourite country to ski in. You get beautiful scenery, fresh air, sunshine, good food, good wine, good fun all under the umbrella of having an active holiday with plenty of exercise. All this without even breaking into a sweat = winner. Well, I don’t break into a sweat anyway, but this is because I am a very fair-weather skier. I am not one for getting on the slopes first thing in the morning and skiing all day until the lifts stop. No, my skiing day tends to go like this; wake up from a good sleep, have a good leisurely breakfast, have a bit of a ski, stop for a drink (non alcoholic as it is indeed still morning and that would just be wrong, a nice restorative glass of coca cola will do nicely), bit more of a ski, stop for lunch (something warm and hearty, my favourite is goulash soup with crusty bread) bit more of a ski then we are almost at après ski o’clock where we can toast the success of the day over a few shots of some interesting schnapps and then off for an early evening meal with interesting, wholesome food and then an early night for all. Sleep, ski, repeat. 1. Improve on fitness so I can ski better and for longer. 2. Pack spare pants into my hand luggage...My luggage was not on the carousel at the other end and did not show up for a day and a half so I had to manage with the clothes I was wearing. Luckily there were shops at the airport so I could buy emergency provisions, however the only place that seemed to be selling any underwear was Victoria’s Secrets and my initial foray into the shop was not looking that promising as I looked at all the very pretty, but very flimsy lacy thong frippery going on. I must have had a look of consternation on my face as the shop assistant came to my rescue and managed to steer me in the direction of the Big Pants, which were hidden away in a drawer. Or maybe I just looked like the sort of person that requires Big Pants. It felt a bit like I was undertaking some sort of clandestine operation, asking for Big Pants in the shiny theatre that is Victoria’s Secrets, I almost felt like I had to ask for them in a whisper so as to not horrify the other shoppers. 3. Improve on fitness so that I can fit into smaller pants if required. 4. Don’t drink more than 2 shots of Schnapps (or petrol eyeballs as they are also known) in one sitting - it’s not big and it’s not clever. This time we have been skiing in Westendorf, one of our favourite resorts. 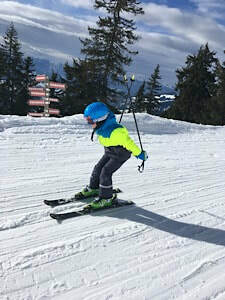 It is very family friendly with the nursery slopes located in the centre of the village and excellent ski schools. There are a range of runs locally catering for beginners and the more advanced and lovely tree lined runs back into the village. There is also easy access to the Skiwelt if you want to ski further afield.